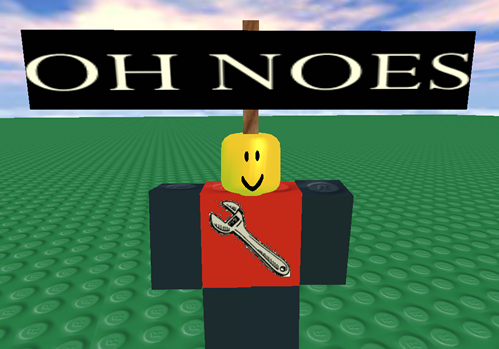 Roblox just got updated. players had to wait 2 hours for this. but the update isnt so… great but lets go thru the list of new updates. These is a link to the Terms and Rules. 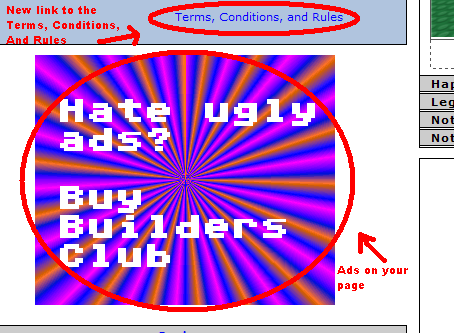 plus theres an ad on anyones ROBLOX profile. kinda a pain to deal with… but lets move on. So now everytime you get a message and read it or go to any item in the Catalog, you’ll see that the image of a player is bigger then before. the comment image of a player is HUGE. which means you’ll see less spam on a page. 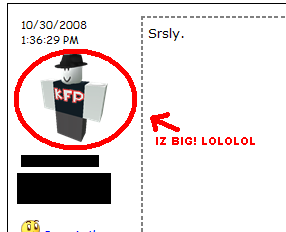 the mail image of the robloxian who sent you the message is bigger. as you can see its alittle bigger. i think its kinda cool. lets move on. In this update we now have the SuperSafe Privacy Mode. Its where it doesnt show any text, forum posts, personal blurbs and place desc. this mode is for kids under the age of 13. or atleast kids around 8 and under. ok lets move on. Ok in this update there are some new stuff when you make a new account. like the “how old are you” step. roblox doesnt ask for an age age. it just asks if your under 13 or not. if you pick “Under 13” when you pick out a name and password it will take you to the email step where it says “Your Parents Email”. if you pick 13 after you pick out a name and password… it will say “Your Email”. and you can pick the “Enter Email Later” or the “Ok, Done”. so basicly you can enter your email later or now. kinda neat.